Carnotaurus was originated in Patagonia and Argentina. It is either going to be really simple or confusing because of the following. Carnotaurus was a Carnivore and it's from carnotaurine family group. You may think that it the name sounds like a monster movie, and it should because this Dinosaur has played in a long list of fictional characters in movies such as Jurassic Park 2, Dinosaurs (Disney), Land Before time, and several top selling video games for the Playstation Franchise. All of these moments of fame for the dinosaur are not realistic. In most of the movies the Carnotaurus was pretty much a mirror to the T rex being the same size but that's not true. 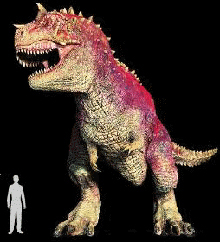 The Carnotaurus was up to 6.7feet tall and 23 feet long and weighed on an estimation of 1.7 tons. Right above its eyes there were horns somewhat like a modern day bull. It had a small skull, thick chest, and a thin tail. It also had very un-developed arms, but strong legs. They were almost like the T rex, but even smaller. The dinosaur had a strange eye structure. They faced forward, which is very unusual. This dinosaur may have had excellent forward vision because of this. I did mention that it was a carnivore, but there has been a little bit of debate on if it ate Plants as well because it had both herbivore like teeth and carnivore teeth.